Those of you who have been enjoying Vampire: The Masquerade will be pleased to know there’s some quality gaming gear on the way for the game. 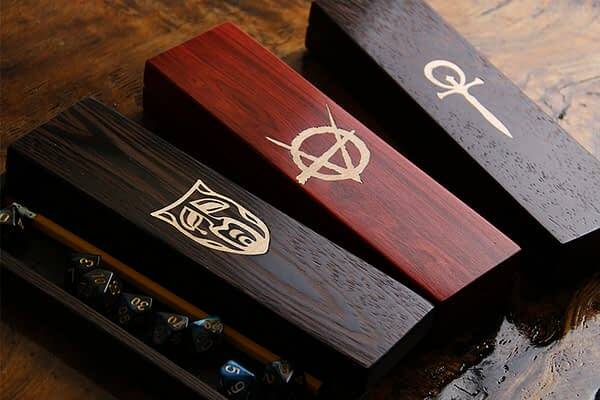 Geek & Sundry showed off some of the new gear being made by Elderwood Academy and Dog Might during their L.A. By Night stream, featuring dice boxes, rolling trays, gaming screens, and more all made of hardwood with some of the finest finishes you’ll see on gear like this. Just looking over all of these gives us goosebumps as they’re customized to the game. Check out the video and some of the details below about the gear, which is absolutely to die for.